The main objective of the National Conference is to advance knowledge in building sciences in general, and in aspects of building and construction in particular; to solve long-range problems of the building sector through methodological research and development; to provide support in solving short-term needs in areas where its expertise is crucial; and to disseminate knowledge and transfer technology. 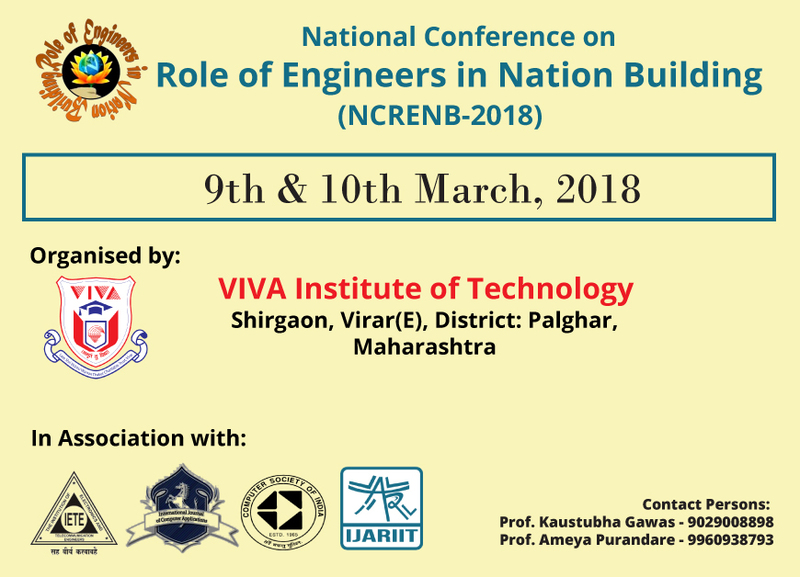 VIVA Institute of Technology, Mumbai is organizing the national conference on the “Role of Engineers in Nation Building” on 9th and 10th March 2018. The role of an engineer is far-reaching and beyond the vistas of human thinking and imagination. The emerging technologies of communications and computing have brought about a revolution in everyday life during the 21st century. The familiar mobile phones, CD players and fax machines are being joined by digital broadcast radio and televisions which offer more channels and much clearer sound and pictures. The application of Science and Technology (S&T) is the main agent of industrial economic and social development. Universities, Public and research institutes, industry and government have to become more closely involved and aware of the importance of co-operation with S&T to promote sustainable economic, social and industrial development.